Summary: Tuesday is looking picture perfect, while rain chances increase tonight through the rest of the work week. Today we are waking up a bit cooler than we are used to in the upper 40’s to lower 50’s this morning. However, things will warm up fairly quickly to a pleasant 68 degrees. Overnight, there is a very small 20% chance of rain and thunderstorms as the low temp will fall to a brisk 49 degrees. This is due to a system moving through Kentucky overnight and could swing a shower or two our way while we are sleeping. Wednesday and Wednesday night we see a 30% chance of rain as a few more waves of moisture sweep Kentucky and could sling a shower or two our way. Our high temp will reach 72 degrees while our winds will be 5-10 mph out of the west during the day, then turning from the north overnight, where temps are expected to fall a bit more to 45 degrees. Thursday there is a slight 20% chance of rain but that isn’t something to be too concerning. It appears our next serious rainmaker could come in Friday night (60%) and into Saturday (50%). 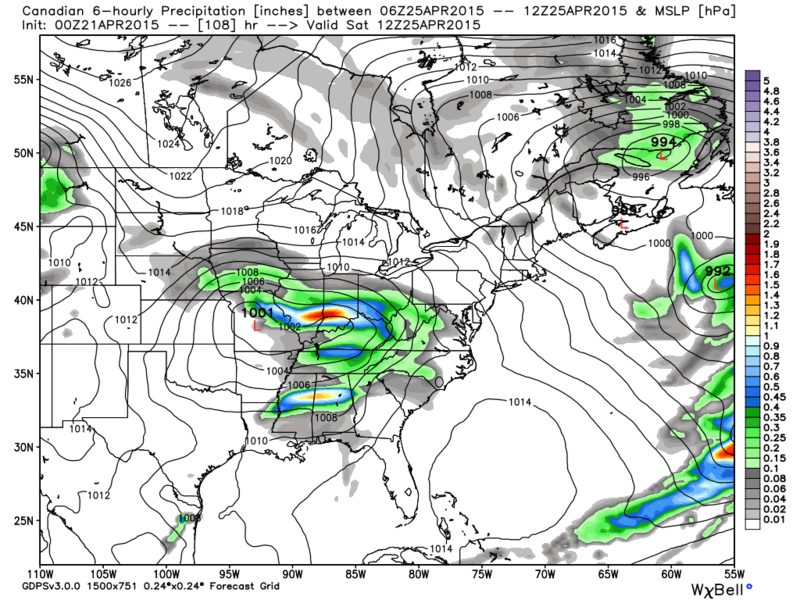 The Canadian model paints a good chance of rain for between 1am Saturday and 7am Saturday. This is because a low pressure center is expected to run through Kentucky and into the Carolinas, bringing with it a trailing cold front that is likely to set off some showers and storms. Currently, we aren’t outlooked for any severe weather right now, but it is also still a bit early. We will watch to see if this develops into a severe weather event or just simply a lot of rain. Takeaway Note: Don’t be too eager to plan outdoor activities on Friday and Saturday, as it could be a washout.